Description: CN 5702 in the same consist as 5699 in Fort Worth, Tx. Description: A solid lashup of CN motors roll up on the High Line with the Humboldt cars in tow, ready for Northtown. Description: CN 398 rolls around the corner just west of the station, and leans into the Chicago wye to do some yard work. Description: With its work in the yard completed, CN 398 highballs east through East Durand, mile post 255. 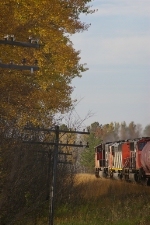 Description: CN 398 with a clear signal at East Durand. Description: CSX Q62027 heads south. Description: a westbound freight rolls through Durand.